I figured as much but it's a long document, even in sections it's long. I'll break it up more I just hafta edit it more. @KnightDemon since I cannot attach a word document on here would u prefer I just send my file over pm? Otherwise as I mentioned before I've organized the ideas mostly based on the game they're from and I have the Blood Omen 1 ideas ready so I can post that on here for every1 to see. Yes but after I upgrade my computer (don't know when that'll be) as I can't install forge past 1.7.10. If you can upload the document somewhere and then PM me with a link to download it, that would be great. So it's been a while since I posted, my apologies, been very busy with work. I do however have some neat things to show off to you all, give me roughly 1 more day, 2 tops, and I'll post pictures of them. (not an update, I want to stress this is NOT an update) Hopefully I can get an update out before Halloween, would be a nice addition for people to play. I am not very good at this Mod creator thing am I? I said I'd provide update information, didn't do that, I'd say I'd keep in touch regardless, didn't do that. I'd say I'd make smaller updates so people can play, haven't done that. I'm really not that great. Well regardless, I do have a screenshot to share with you all. It's not much but it shows of a couple of things. The texture for the basin on the left isn't set, it's what was submitted to me and I tried it in-game and haven't changed it since. It has grown on me so I'll be editing it slightly and making it a permanent change. 2 obvious things standing in the middle and then the orbs have had a slight change too, middle one is a basic Energy Sphere. I will gladly wait in order to see this mod updated! Nice to see some LoK fans working on a mod here Well done with the Reavers, looking forward to seeing where this goes, keep up the good work, and I wish you luck! Hello one and all !! Welcome back yet again, I hope you're all doing well. Nice to see a new face, Samantha77, welcome. Just thought I'd share a few details of what I'm working on but sadly there is NOT an update yet. So to begin, I think you all or most of you know that I'm working on the Reaver doors. Well that's progressing but not there yet, they need to be finished before an update can happen because there's that much code written for them that also intermingles with other parts, releasing them without them working is not okay. Vapires can die and when they do they might become a wraith, if they do then you have an elemental wraith in which you can capture them with an element sphere. This sphere will be the main way to get elemental upgrades for the basins, doors, and possibly others. This method was in fact inspired by Drakepire's suggestions and works well in my opinion, still have to test a few bits of it. Also Drakepire, I've been looking over the document quite a bit, there's a fair bit I could quite easily do. Because I haven't played BO1, most of it doesn't feel like it fits, however I think I might make a small separate mod that will have the bits in that I like, will be compatible of course, and after playing BO1 will likely merge them together if they feel like they should belong afterwards. Yeah BO1 was done by silicon knights as opposed to the rest of the series being done by eidos and crystal dynamics, it's more of a fantasy adventure game compared to the rest of the series, but wow lots of mobs from that game, if included would make your mod a big mod that would be a nice add in to modpacks for players who like adventure and fighting mobs off. Honestly I could just send u a link to a walkthrough of BO1 on youtube. So you combined wraith vampires with elemental shades? Actually that's not a bad idea, they just need glowing eyes and that cloak I see on their torsos just needs to start from their shoulders. What do you mean elemental vampires? Like are the soul reaver clans gonna have elemental abilities? Or will they just drop elemental wraiths? Because aside from Rahab's clan which fire water bolts/charges and can swim in water, the clans don't have any elemental affinities (Turel's clan just lives in a volcanic area, and the Melchiahim just dig). As for the element spheres, I assume you changed the name from the original energy sphere(s) to elemental sphere(s)? So do they essentially function as safari nets/pokeballs? And with a captured wraith be used as crafting ingredients? What about for getting elemental reaver enhancements and upgrades? Tier 1 reavers r fine this way, but what about for tier 2 (aside from light and dark, just make those require more wraiths)? Aye bits you like, well just message me what you would and would not include from my document I sent you. No that's alright, I'll search it up myself unless you have a very specific lets play you just want to advertise to me. And that's nice to know there is plenty of mobs to add but also a bummer as thats lots of modes to make and code to write for some thing I'd have no clue about xD We'll get there eventually. Yeah I basically just combined them. I didnt see much point to having both when one of them is basically a non elemental shade. Feedback like the glowing eyes and long cloak is good. I thought that it needed eyes to distinguish the face, it already has but not to that extent, I'll look into how endermen and spiders get their glowing eyes and add something similar, shouldn't be too hard to do. As for elemental Vampires, it is more of a work around to have elemental wraiths spawn in the world, not exactly lore friendly I know. They currently change colour depending on if they are elemental as well, I can disable this (or even add a config option?) if you think it shouldnt be seen that they have an elemental affinity. Right now the elemental affinity doesn't do anything besides maybe affect their interaction with the world, think water elemental can survive in water like the Rahabim and the light affinity having a higher tolerance for light. I can just disable this completely though and have the element just be what determines the wraith elemental that spawns? I can always change the name back to energy spheres, or they can both exist as different things. and yes, they are essentially safari nets for the wraiths. and the wraith isnt captured, it transforms the energy/elemental sphere into a typed sphere, so a dark spehre, a fire sphere, etc. Which will then be used for crafting. I want Tier 1 to be forged, I have a way to get this working, not by world spawn, which was my original thought, but another method. Tier 2 will still be tricky, I do want that to have to absorb ancient vampire souls like in defiance though. That's a long list then, There are lots of things I like, and then others I don't see fitting into the Kain universe, but again it's mostly because I haven't played BO1. I'll do a write up when I have some spare time and see where we go. Honestly sounds like you could use helpers to help you model and animate at the least, unless u know coders too. Well in NosgothTM Dumahim have smoke bombs and can turn into shadows, Razielim can flap gusts of air, Turelim take on a volcanic skin texture when using their "ignore pain" ability, Zephonim have a glowing "Eldritch Blade", so for the most part disable it completely for now but make it so certain clans will only drop certain elemental wraiths: Razielims drop air wraiths (increase drop rate if killed while airborne), Turelims drop fire wraiths (increase drop rate if burned to death), Dumahim drop dark wraiths, Rahabim drop water wraiths (increase drop rate if killed while in water), Zephonim drop light wraiths (increase drop rate if killed by sunlight), and Melchiahim drop earth wraiths. What about material wraiths or non elemental wraiths? (material reaver wraiths, only 1 was seen in the air forge in sr2, the non elemental wraiths were seen in every temple and around and under the pillars). Non elemental wraiths could just be basic souls for replenishing health, while material wraiths could be friendly summons that fight for the player. Existing as different things is good; elemental spheres for when an elemental wraith is "absorbed", glass energy sphere when empty, energy sphere if you're still ok with the portals using a power source. 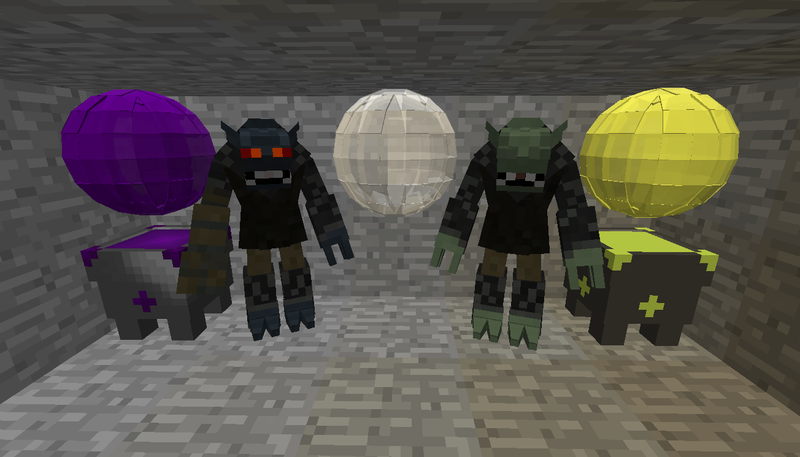 As for the guardians, use energy spheres as well, just have the sphere turn into another typed sphere according to pillar principal absorbed (with the item texture taking on the principal symbol), though obviously since these r bosses the player would have to defeat them until they die, spawn a transparent wraith of themselves, then get "absorbed" by a glass energy sphere. It beats the spirit vessel i mentioned several posts ago, though this is dependent on how u wanna do the spectral realm if at all. I am good enough to make models, animate and code all by myself thank you, unless you just mean generic helpers which I'd want to say yes to BUT I am very protective of work... If you want proof of what I can do, just have a quick look at my signature, the MedaCraft mod, I made it all myself, and if you want to see the scale of detail I can put into models, google "Alphamon and Omnimon digimobs mod", I made those both, along with their animations. Those are good to know, never had a chance to play Nosgoth you see. The actual current set up is that I am keeping the generic vampire that I have, may remove after I've done all the clansmen, or just keep because in BO1, SR2, Defiance, and BO2 there were other vampires that weren't part of the clans, I may very well remodel them though but keep them as a mob. Currently, Dumahim (as the only clansmen) will spawn a wraith on death, this wraith will be a basic non-elemental wraith unless the Dumahim have "evolved" to an elemental type. After death of course they will gain the element of the Dumahim. The generic vampires have a smaller chance of becoming elemental and also have a small chance of spawning a wraith on death, I wanted it to be rare enough that not everyone could just gain a bunch of elemental spheres. I'll keep them different then, I loved the power source idea for the portals (will be a while before they are added though, sorry.) and will be keeping them. If I have pillar guardians be absorbed, and when pillar guardians die, a new one is born to replace them, then them respawning is perfectly lore friendly. So absorb the pillar gaurdian, would this pillar sphere then be used to craft the pillars or should they be used for other crafting? such as unlocking tier 2 reaver powers? And what was so wrong with the spirit vessel? I thought it was a neat idea, not sure how I would have made it work exactly, but neat. How would these two ideas differ so much and would one be preferable over the other? Well I want to make the player go invisible, and interact differently as though they were in a spectral realm without changing dimensions, however it's proving difficult and wouldn't be in for a long while. Ultimately we would have to see where the spectral realm ends up in the mod as it's something that would take great effort and knowledge, both of whcih I lack, to pull off. I just mean generic helpers to help u with the workload, yeah I saw your signature. I signed up to be a beta tester when it was 1st announced but laptop broke around same time, later got to play it but my laptop couldn't handle it, so i just watched pwedepie and other youtubers play it online, it's like a fantasy, gothic, steampunk version of overwatch. Well in BO1 there's actually only vorador's brides (3 variations), sr2 they were cut but u can look up their models and concept art, BO2, yes I typed those out in the document I sent u (tried to assign them a generic name with their character name in parentheses just wouldn't include said name for the same reason as Janos Audron and Vorador not having their names), eh yeah a basic generic vampire mob is always good. That's fine, just wondering what the portals are gonna look like. You mean for the wraith pillar guardians? So you wanna have the quest style go in the order of absorbing the wraith pillar guardians then spawning the human guardians from BO1? Well that's not a bad idea (even though that's kinda reversed but makes sense). The pillar spheres yes used for crafting tier 2 wraith blade elements. As far as being used in other crafting recipes? The only thing i could think of is balance emblem locks and barriers. Actually are you including the human guardians too? If so you could have them drop their pillar tokens; both as a trade item and perhaps related to the pillars too. Trade the tokens to the reaver guardian (janos audron) for the balance emblem fragments. Otherwise it would be easier to just craft the upgrade using necessary pillar principles... but to apply it yeah guess the spirit vessel is necessary (just not sure on the gui for that), though using it as a kind of automated soul collector should be its secondary purpose. If ur not gonna have it be a separate dimension, then u would hafta have the player be invisible and intangible to "material realm" mobs and intangible to water, spawn in spectral realm blocks (to help with how buildings and pillars tend to distort and warp around when Raziel shifts into the spectral realm), add in planar portals/corpses to re-materialize in, on top of adding in spectral realm mobs. Honestly the workload isn't the problem, it's real life management, I have a full time job, and then upkeep of a house to worry about. Then I need a little bit of downtime and it all just adds up together. The workload I can do, figuring out new mechanics is a tricky subject but I do enjoy that bit and then coding the rest of it, I can be fairly quick at doing so it's not a problem, but nice to know you're worrying about me. Thank you. 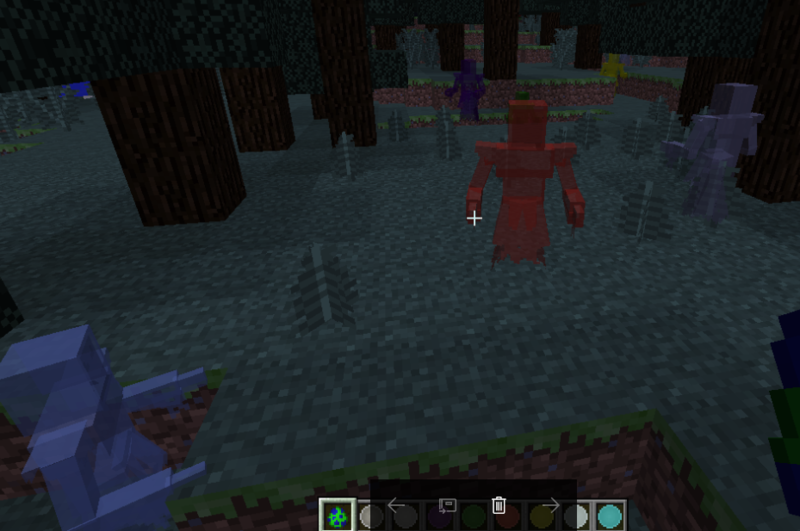 Well I'll be adding things like that eventually but they are just fluff pieces and really on mechanics being built into the mod first, mobs are simple to make when it comes down to it, not to mention I have a basic Vampire entity, and I can just code a new vampire by extending that one, then just changing the model and texture round. Honestly it's rather simple with what I've done. I would like to include named characters, after-all I already have named weapons, but you could argue they are just named a certain way... but it's copyright, how far can I take it before action is done, who knows, after-all just look at Pixelmon, they went forever before anything happened. Portals don't have a final design yet, Make a sketch or a "basic" build in minecraft and post it to me. I can think of various ways I could make it myself, but if I have submissions they might look a lot closer to lore friendliness, just keep in mind that Defiance and SR1 had different portals (you know) however I'll be making a combination of the 2 to be together, although I suppose I could do short range portals between 2 points and it would be far simpler to make but not nearly as extravagant xD. I haven't given any thought to the pillar guardians yet, however my point about them respawning would still be lore friendly. As for the wraith versions they wouldn't lore wise respawn, I'll need to think more on this before I allow tier 2 weapons to be forged by the sounds of it. The idea about swapping pillar tokens for the Physcial Reaver upgrades is a great way to add them into the mod. I'll keep it in mind. My plan for the spectral dimension is to have it be in the same dimension as the overworld for a few reasons. If it was a separate dimension then any buildings made in the overworld wouldn't transfer over to the spectral realm. And I know that I can eventually make the player be invisible, not be affected by water, not interact with entities, not be affected by certain blocks, all the things i need to make a spectral realm work in Minecraft, the only trouble is that I don't know how to do it all yet. I know this is possible because of other mods AND "Spectator mode" in vanilla Minecraft has a lot of these features already so I can do it. If you have a better idea how to get a spectral realm working, I really want to hear it, it's one of the troublesome parts of my plans and could do with as much thought into it as possible. I'm sorry, as usual I've written far too much and made far too little sense. But at least I can confirm progress is happening code side. The only reason I suggested more generic names for character vampires is for players unfamiliar to the LOK series as a whole, but up to u.
ok, i'll try to come up with a preliminary design or build for a combined portal. Human guardians respawning? I suppose that's ok.
"The best I can suggest is it [the spectral realm] creates a dimension, same terrain generation, but also replaces blocks with impervious versions. Bedrock but same textures, maybe slightly different. I wouldn't suggest recreating the world block-by-block because that would eat up a ton of RAM, depending on how much of the overworld is already generated and built. OR, when the player enters this world, it could activate a set of custom Game Rules, where the daylight cycle stops, certain mobs spawn, certain textures replaced, Water has no effect, and would put the player in Adventure mode (can't interact with blocks n such, but can interact with inventories and mobs.)"